"West Side Story" is my all time favorite musical. "West Side Story" updates William Shakespeareâ€™s "Romeo and Juliet" to New York City in the late 1950s. The Jets (Whites) and the Sharks (Puerto Ricans) are two youth gangs fighting over their little piece of turf in the concrete jungle. Love blossoms between Maria (Natalie Wood) and Tony (Richard Beymer). Maria is the sister of Bernardo (George Chakiris), the leader of the Sharks. Tony is the leader of the Jets. 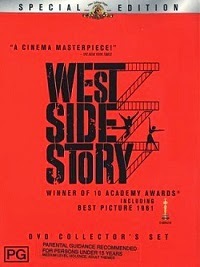 "West Side Story" won 10 Academy Awards including Best Picture in 1961. The film is a magical journey of music, dance and surprisingly frank humor. The Leonard Bernstein/Stephen Sondheim music and lyrics are brought to life by a wonderful cast and crew. It took two directors to bring this wonderful film to the screen. Both Robert Wise and Jerome Robbins won the Oscar for Best Director. Over the years, some critics have complained that the lead actors (Natalie Wood and Richard Beymer) hurt the film. While they don't bring the charisma to the screen as their co-stars Rita Moreno, Russ Tamblyn and George Chakiris, both leads deliver good performances. For me, the real star of this movie is Stephen Sondheim. His smart, funny lyrics remain fresh after years of listening. "America" and "Officer Krupke" are standouts. "West Side Story" is one of the best movies ever made. This is a must have DVD. Outstanding movie, picture, sound, menu and extras. Do not let this one slip by you. MGM did a wonderful job restoring and transferring this classic film. The colors are vivid. With the rich colors found in "West Side Story," the chances for bleeding and delineation problems are great. There are no such problems on the DVD. Excellent flesh tones. The soundtrack was remastered in 5.1. When my screener came in the mail, I cranked up the home theater system full blast to listen to my favorite song: "America." Full, rich highs and lows. Excellent balance between the ranges. No distortion. The 5.1 track make full use of the front and back channels. One of the best menus I've ever seen. A wonderful combination of music and images from the movie. Each menu has its own design based on one of the movies big musical numbers. Nice animation. Easy to navigate. No Easter Eggs found. "West Side Memories" is a one-hour retrospective documentary covering the origins, casting, rehearsals, production, release and response to "West Side Story." The film contains interviews with almost every surviving member of the film. The biggest treat for me was the inclusion of the original vocal recordings of Natalie Wood. While, Ms. Wood does not have the range of Marni Nixon who did her singing voice in the final film, Ms. Wood\'s rendition of "I'm So Pretty" and "Tonight" are quite good. I didn't know that Russ Tamblyn's voice was also dubbed in the "Jets" song. The documentary includes a comparison of his version and the version in the final film. Another high point of the documentary is lyricist Stephen Sondheim's the various comments on the film. For me, Sondheim is the best there ever was. I enjoyed getting his insights into the creative process that went on during the making of "West Side Story." The Storyboard comparison is a four-minute montage set to music. These storyboards are works of art. Full-color drawings which encompass not only the image composition, but also the colors and thematic designs of the shot also. There are four trailers: Original Theatrical Release, Original Issue, Reissue and Animated. They give you insight into film promotion from a by gone era. There are three galleries covering production and concept design drawings, storyboards and behind the scenes stills. The galleries are extensive with nearly 100 photos. The set comes with a 175-page book filled with great memorabilia. There is a complete script, a reproduction of the original theatrical program, reprints of reviews and an introduction by screenwriter Ernest Lehman. There are tons of photos also. One of my Top Ten all time best DVDs. Fans of movie musicals will love this set. A must have. A bargain at the price.